Is Your Money Safe during the Government Shutdown? Government Shutdown Fallout: Is Your Money Safe? All eyes are focused on Washington DC and the government shutdown. The stalemate in Congress over funding Obamacare is ballooning into an even larger and more contentious squabble over raising the debt ceiling. Even though we fully expect the nation's borrowing limit to be increased once again, the government shutdown and political theater surrounding it is focusing investors' attention on the nation's debt crisis – and that figures to ultimately be bullish for precious metals. The shutdown is also providing ideal cover for the Federal Open Market Committee (FOMC) to put off all serious talk of "tapering" at its meeting scheduled for the end of the month. Government economic data, including last week's key report on September employment, will be delayed until bureaucrats at the Bureau of Labor Statistics (BLS) return to work. Investors now expect Fed Chairman Ben Bernanke and the FOMC to demur on reducing monetary stimulus once again. They may use the economic uncertainty of the shutdown and even the lack of data as excuses. In the meantime, the precious metals markets remain range-bound. Notably, silver has ended the last two weeks unchanged from the prior week. Last April's crash in metals prices spiked demand for bullion, and premiums surged as dealers competed for scarce inventory. The premium added to the spot price more than doubled for some silver products, especially when it came to dealers without the fantastic sources enjoyed by Money Metals Exchange. Demand remained strong through the summer, but September slowed down and premiums began drifting lower. Investors can finally take full advantage of today's lower metals prices. No longer must buyers give back a significant portion of spot price savings in the form of higher premiums on coins, rounds, and bars. Pre-1965 90% silver coin premiums dropped significantly in the past 3 weeks. They currently range between $2.00 and $3.00/oz – higher than the historical norm, but considerably better than the practically unheard of $5.00 - $6.00 range seen just a few months ago. We don't expect premiums on these coins to fall back under $1.00 (where they were 1-2 years ago) without more holders of these coins becoming motivated to sell them back into the market. Significantly higher spot prices will likely be required. them a much better buy than the last few months. 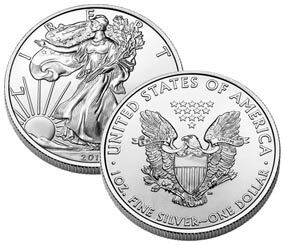 Premiums on Silver American Eagles are back to within $0.20/oz of the levels seen prior to the April price smash. Current premiums range between $3.00 - $4.00/oz. At the peak of the Spring buying frenzy, many dealers stopped accepting orders altogether – unable to make any commitment regarding delivery. Premiums peaked near $7.00/oz at some dealers for a brief time. Meanwhile, gold premiums are also down slightly, though there was less room to fall than for silver. Premiums rose a modest $10 - $20/oz, but those gains evaporated in recent weeks. Investors can buy one-ounce gold bars for $39/oz over spot during Money Metals Exchange's month long promotion. Gold Maples and Kangaroos range between $50 - $65/oz premium, and Gold Eagles run between $70 and $80 – very near the average of the past few years. And lead times for delivery have receded along with high premiums. Mints and refiners finally caught up with demand in recent weeks and dealer inventories are back in shape.Money Metalsis currently shipping all products with zero delay! Investors are focused on the Congressional impasse surrounding Obamacare and raising the Federal debt ceiling. Many of the regularly scheduled government reports on economic data such as employment, GDP and CPI are delayed indefinitely. Staffers at the BLS and other agencies were deemed "non-essential" and put on furlough. Wednesday, Oct. 9th – FOMC Minutes. Minutes from the September meeting, where officials surprised the market and elected to continue $85 billion per month in stimulus, will be released. The other major reports originally scheduled for this week, and now likely to be delayed, include International Trade, Jobless Claims, Retail Sales, and the Producer Price Index.